Madhubani Art in present times. 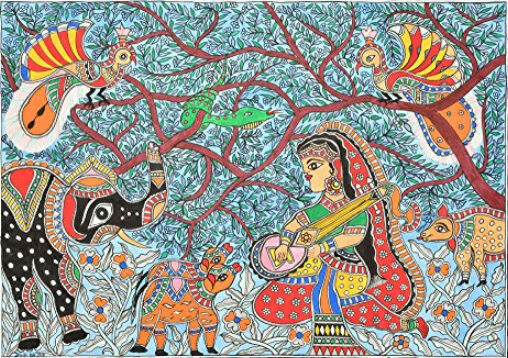 How Madhubani paintings saved a forest? Madhubani painting is still ceremonially practised by several women of the Ranti village of Bihar state. Local artist Karpuri Devi, sister-in-law of well known Madhubani artist Mahasundari Devi, Mahalaxmi and Dulari are women from three generations of the village of Ranti who have uphold the legacy of the art form by training the other women in the village the nuances and techniques of Mithila painting, regarding it as a way of life and a career. The Government of India has commissioned the works of the three women artists; the famous Mithila museum in Japan has been showcasing Madhubani paintings since decades keeping the ancient Indian art form alive and well preserved. These women have been putting enormous efforts to empower women through paintings and raising awareness on education and gender issues such as eve-teasing. Their students are encouraged to paint on topics that are near to their hearts – anything from Indian folk tales to Grandma stories picked from various childhood sources to the present status of women in the society. Surprisingly (or may be not), the Madhubani art form has given women wings to fly and be more vocal than ever before as they continue to revive religious & spiritual traditional and break age-old social norms. How Madhubani paintings saved an entire forest? In 2012, Shashti Nath Jha, who runs the Gram Vikas Parishad, an NGO, was fighting the local establishment against the indiscriminate felling of trees in the name of road expansion and development and came out with a rather whacky idea of decorating more than 100 trees using Madhubani painting to conserve the woods. The idea turned out to be really effective in educating the villagers on the adverse effects of climate change and global warming. While the campaign proved successfully, it was an expensive one though, as villagers made use of synthetic paints to let the artwork last longer. Not a single tree fell down as a result of the campaign: trees sported the decoration of Hindu gods and symbolised religious and spiritual figures such as Rama-Sita, Radha-Krishna and scenes enlivened from Hinduism’s two great epics – the Mahabharata and the Ramayana. This instilled a great sense of deep reverence and adoration, and thus saved the woods from being cut down by loggers.